A detail of the two-channel video installation shows El Paso resident Aurore Tarango walking in the dry riverbed of the Rio Grande. Image courtesy of the artists. One fundraising campaign, two round-trips to the U.S.-Mexico border, endless production hours and over a year later, Allison Walsh has completed her documentary Parallel Lines. I’ve been following her process since November of last year and have been completely in awe of her efforts to bring awareness to the unseen joys and struggles of the border cities El Paso and Juarez. The first screening of Walsh’s documentary, Parallel Lines, took place at the Prairie Center of the Arts in Peoria. Allison obtained funding for this documentary through a Kickstarter, seeking to raise $1000 to finance her travels and basic equipment needs for the project. In her campaign video she invited individuals to ask the question “What Divides Us?” The question resonated with many, especially after the recent inauguration of Trump to the presidency. A few months before the opening, Walsh reached out to fellow filmmaker and photographer, Alexis Carballido, to revisit El Paso and Juarez. The two traveled to the border in October 2017 to film additional material and photograph participants, the landscape, Halloween and Día de los Muertos celebrations. The collaboration offers an expansive approach to documentary work. A two-channel video installation shows a vista of the Rio Grande, which helps mark the U.S.-Mexico border. Image courtesy of the artists. A two-channel video installation shows El Paso resident Aurore Tarango walking in the dry riverbed of the Rio Grande. Image courtesy of the artists. So what divides us? I’m sure during the entire documentary process Walsh must have asked herself that question a million times, maybe coming up with an answer, but more than likely feeling incapable of truly answering it. She brings to light that we are not dissimilar from our southern neighbors, that our hearts long for acceptance and crave the support of our communities, regardless of nationality. 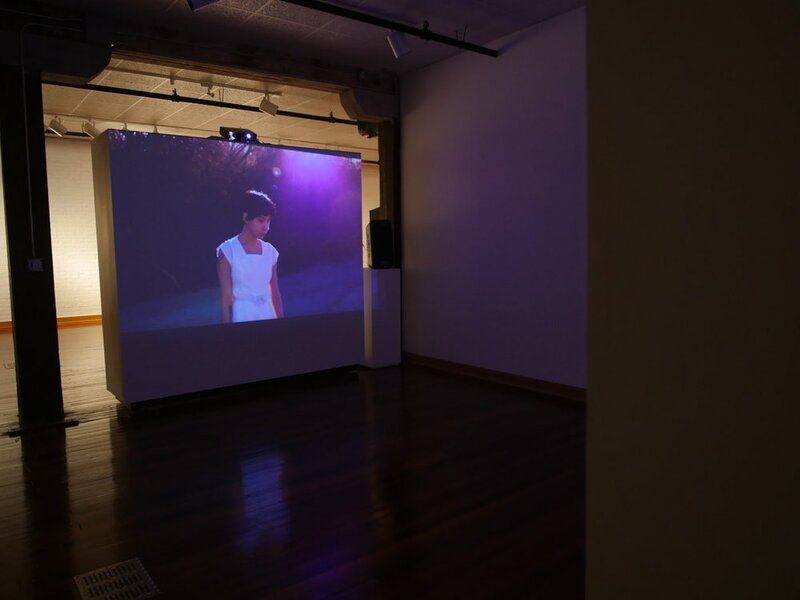 The film was projected on two separate walls mirroring each other in the back of the gallery, creating an intimate and safe space. Watching her film, it felt as if the gentle breeze and the soft light on screen was real, grazing our faces as we watched together. The interviewees talk about gentleness and acceptance, about their fears of a potential wall, about their adult children who have officially moved to the U.S., about the jobs they once had in the States, and about the love they have for the city beyond the fence. 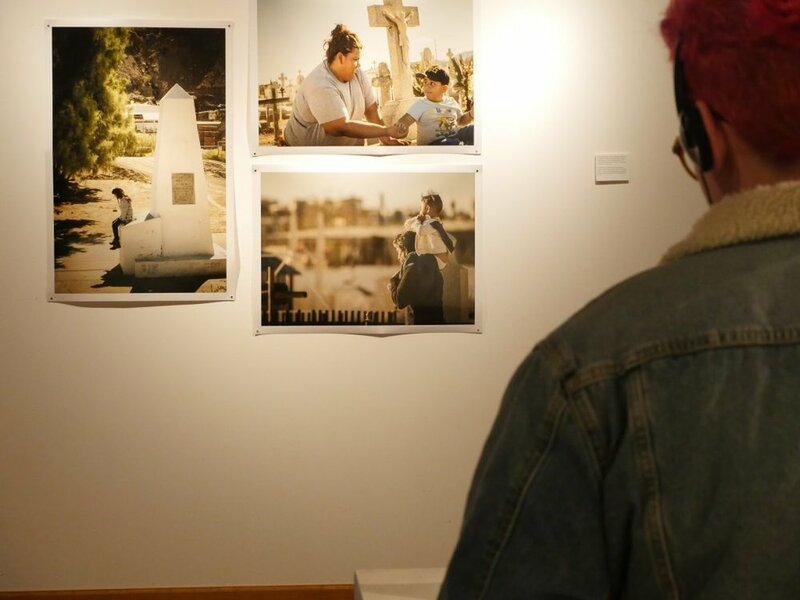 An installation shot of the exhibition shows portraits of El Paso and Juarez locals, a drone shot of the landscape along the fence, and two iPads with videos playing. Image courtesy of the artists. A video shows a Juarez local celebrating Halloween in El Paso with family and friends. Image courtesy of the artist. Viewers watch a video about Día de los Muertos in Juarez in front of photographs of families visiting cemeteries. Image courtesy of the artists. 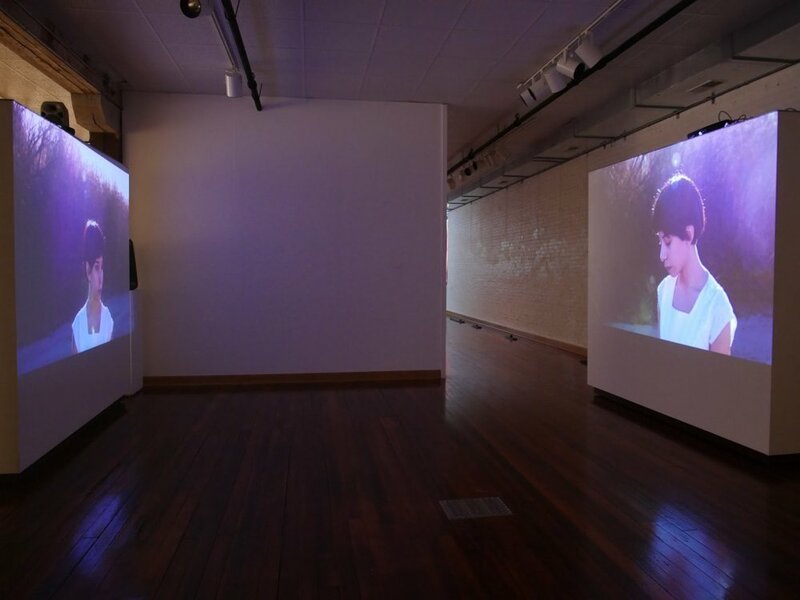 Shorter video works were shown on tablets docked on pedestals throughout the center of the gallery. These clips gave more insight into specific situations that those who live on the border encounter in their daily lives. Emphasizing that the border is their home, they don’t see the cities as separate but as one large city working together, building traditions, and making new ones that fit the cultures of both places. I imagined myself on the border, walking through the city of El Paso, talking with the gentle-minded people. People who opened their doors and hearts to the children of Juarez on Halloween night, sharing the customs of dressing in costumes and collecting candy. The film captured the laughter and excitement of young Mexican families going from door to door of their American neighbors, relishing in the fall ritual. The walls surrounding the shorter video works were hung with Carballido’s photos. They present the silent history of those living and working on the border. The photographs capture a Border Patrol agent, his stitched name tag blurred out, who happily talked with Walsh and Carballido about his personal experience and disinterest in a new border wall. A mother whose eyes fail to hide her emotions and weathered skin illustrate years sun, laughter, and worry. And a young woman, maybe in her twenties, who peers into the lens seemingly with distrust about the future for the neighboring cities. Walsh and Carballido brought to Peoria stories that are rarely heard, rarely seen. And while many of us were there to celebrate Walsh and Carbadillo’s hard work with the screening of Parallel Lines, I think we all left asking ourselves “what divides us”? Jessica Bingham is an artist, curator, and writer living in Peoria, IL. She is the co-founder and director of Project 1612, an independent art space and short-term residency program. Follow her on IG at @Jessica_Bingham_Art and Project 1612 at @Project1612.